The Order was founded by the Emperor of the Romans, Flavius Constantine, the Great to commemorate the discovery of the Holy Cross by his Mother, the Empress Saint Helen. The succeeding Emperors of Constantine the Great respected his mandate and the Order was continued in the Roman-Byzantine Empire, enduring over the centuries to this day. Its decorations are bestowed in accordance with ancient standards, and to confirm established custom, it is awarded to ladies only. The Order of Saint Helen thus becomes the feminine counterpart of the Order of Constantine the Great. Both Orders complement each other historically and are branches of the same trunk. Both were founded by the same Emperor, sustained through the same Empire and Imperial House, and conveyed with the same regard as such. Little is known of the origins of St. Helen, other than she was born of humble parentage (an innkeeper’s daughter) in middle of the 3rd century AD, most probably in the town of Drepanum (later known as Helenopolis, apparently so named by Constantine in honor of his mother) in the Nicomedian Gulf, a seaside resort in Turkey, although some sources believe that she was born in England. In any event, she became the wife of Constantius Chlorus, a Roman general. They had one son, Constantine, who was born in Naissus in Upper Moesia, in the year 274. After 22 years of marriage, Helena’s husband was named Caesar under Emperor Maximianus Herculius, his patron and well-wisher, and immediately divorced Helena to marry Maximianus Herculius’s stepdaughter, Theodora, for political gain. Fourteen years later, in 308 AD, Constantius died, his son was proclaimed Caesar, and 18 months later, Emperor Constantine made up for the neglect his father paid to St. Helena, ordering all honor be paid to the mother of the sovereign, summoned her to the imperial court, conferred on her the title of Augusta and had coins struck bearing her effigy. Constantine’s influence caused his mother Helena to embrace Christianity after his victory over Maxentius at the Milvian Bridge. She converted to Christianity at about the same time, when she was 63 years old, in the years 312-313. It was her son, Constantine, who issued the now famous “Edict of Milan”, permitting Christianity in the Empire. Constantine sent his mother Helena to Jerusalem to try to find the cross on which Jesus was crucified. When she arrived there, she requested all the Jewish Rabbis of the whole land to gather to meet her. They were terrified, suspecting that she sought the wood of the cross, a secret which they had promised not to reveal even under torture, because it would mean the end of Jewish supremacy. Sure enough, she asked for the place of crucifixion and when they would not tell, she ordered them all to be burned. Frightened, they delivered up a man named Judas (not Iscariot) saying he would tell. She gave him a choice of telling or dying by starvation. Six days later, after total abstinence from food, he came to terms with her, and on the seventh day he promised to tell. He was brought to the place indicated, and in response to prayer there was a sort of earthquake, and a perfume filled the air. Judas immediately converted. There was a temple of Venus on the spot, which Helena had destroyed. Judas set to digging vigorously, and at the depth of 20 feet, found 3 crosses, which he brought to Helena. The true cross was tested by its causing a man to rise from the dead, or, according to others, by finding the inscription of Pilate. After an exceedingly vigorous conversation between the devil and Judas, the latter was baptized and became Bishop Cyriacus. Then Helena set him to hunting for the nails of the cross. He found them, shining like gold, and brought them to the Queen, who departed, taking them and a portion of the wood of the cross. She brought the nails for Constantine, who put them on his bridle and helmet, or according to another account, two were used in this way, and one was thrown into the Adriatic Sea. 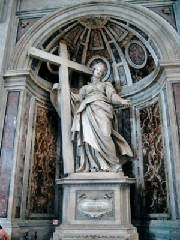 St. Helen went to Palestine where she found the True Cross. She is depicted by Eusebius, church historian, as being driven by religious enthusiasm, wanting to pray at the places where Christ’s feet had touched the ground, caring for the poor and needy, only doing good deeds and being generous and building churches and restoring shrines in Bethlehem, Egypt, the Mount of Olives, and Mount Calvary. Her name is particularly associated with churches at Rome and at Trier, in Gaul. Some accounts say that Constantine was with her when she died, others say Helena died in Palestine during these activities. was with her when she died, others say Helena died in Palestine during these activities. Her remains are now located at the church of the Abbey at Hautvillers in France. Because of her alleged discovery of the Cross, Helena became a saint in the Eastern Orthodox and Roman Catholic Church. Her feast day in the Eastern church is May 21st and in the Western church on August 18th.